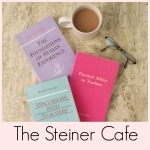 Practical Advice to Teachers is a collection of Rudolf Steiner’s midday lectures to the first Waldorf teachers. And it is full of practical advice on drawing, writing, and reading in the Waldorf approach. On day five of the Teacher’s Seminar, Steiner gives specific tips for teaching the letters: drawing transitions to writing, writing to reading handwriting, and reading handwriting to reading print. Steiner reminds the trainees that yesterday, he spoke of bringing awareness to the children about the importance of coming to school (lessons), and then that they have hands; “start drawing and transition to painting” to bring about a sense of what is beautiful and what is not. Once children have mastered the straight and curved lines “with their little hands,” then we want to show them that there are such things as letters! Steiner gives examples of a picture of a fish becoming an “F,” and a picture of a bear becoming a “B” by reading the word bear and then pointing out that the beginning sound is “B.” Next, point out that other words begin with the letter “B” and some words even have that sound in the middle of the word. Always use capital letters to start with. “Consonants are explained as pictures of external objects but never vowels.” Vowel sounds come from feelings. Steiner says there is no need to make a historical study of writing “in order to find what you need.” Rather, we want to find what we need through our own imagination. We want “to have such ability of soul that you can invent your own examples to offer your pupils with your own enthusiasm.” This is a concrete and organic way to teach writing and reading. I love this lecture. 🙂 Rather than following other teacher’s suggestions for teaching the letters, I find that if we understand the concepts of teaching whole to parts and the sequence of drawing, writing, reading, (and there’s nothing wrong with seeing how others have done it for examples), then we are freed up to come up with beautiful stories and examples from our own lives of letter pictures for our own children. No particular order, start with capital letters, and off you go!